If you aren’t familiar with Felicia Day, you should be. On the right, below the Blog Roll, there is a link to The Guild. It’s a web tv show (the episodes are less than 5 minutes long a piece) and it is endearingly funny. WATCH IT. She’s the cute girl from that Cheetos commercial…she dumps orangey orange Cheetos in with a mean girl’s laundry. You know? That one. 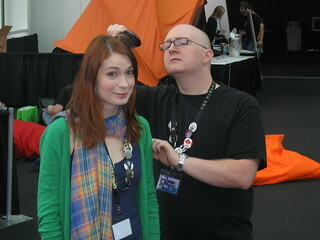 Anyway, she read a Penny Arcade comic where Tycho said he wanted to “groom her“…so she gave him a brush at Pax and commanded him to do so; he wisely complied. Read the story. ~ by thade on September 3, 2008. Felicia Day touched my blog. I have ascended. I have a dozen old improv buddies who still perform out in Boston MA (Improv Boston, Improv Asylum, Three Hole Punch)…anyway, I let grad school eat me (and with me my old comedy digs), but watching you guys makes me want to get back into it. Anyway, if you’re out this way in hickville MA, I’ll buy you a latte and sing you a song. That’s what we do here. @Winged Nazgul: That picture made me lol. Oh man. Remember that time Felica Day noticed my blog? That was awesome. …crap, have I jumped the shark? damn.